Now you can easily add a waterfall or stream to a new or existing water feature. 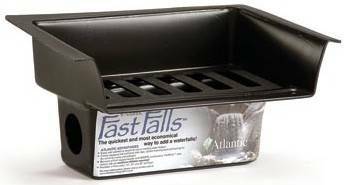 The FastFalls comes equipped with a bulkhead fitting, liner tape for attaching your liner, a foam cube to reduce splashing, and a top tray so the unit can easily be camouflaged. Available in 4 sizes with either a 14", 25", 36" or 48" weir opening.